All A Bunch Of Momsense: Five Question Friday! 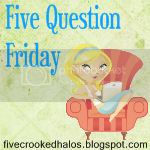 It's Five Question Friday, Black Friday style! Brought to you by the spectacular Mama M.
What, you ask, is 5QF? Mama M. throws us out some questions (FIVE of them, to be precise! Aduh!) and we all link up and check out everyone's answers! Not a blogger, but want to throw in your five cents? No problemo! List yours in the comments! 1. Do you do a real or fake Christmas tree? 2. What is your favorite Christmas tradition with your family? 3. Do you celebrate Thanksgiving in your neck of the woods? And, if so...how many calories do you think you consumed yesterday? 4. Have you started decorating for Christmas, yet? 5. What is your favorite Christmas cookie? My WHOLE family shows up at my house Christmas morning. Of my sibling set, I'm the only one with kids, so the gift exchange happens here. My mom, my dad and stepmom, my brothers and stepbrothers, their respective ladies, everybody. We make up a big ol' mess of breakfast, 5 or 6 pots of coffee, and just enjoy the morning as a family. I LOVE it! Not yet, but that's on the list for this weekend. We have more cleaning to finish first! My BFF Elizabeth makes homemade peppermint patties that are divine, but I won't lie- I LOVE cookies of all kinds! I think my faves though are the ones that the kids help me do- sometimes we do a basic sugar cookie and they decorate. Sometimes we do a big batch of peanut butters, sometimes chocolate chip. The best part is getting to make that mess and have that fun with my crew! Ok- there are MY answers- now, tell me about yours! Um that's alot of calories! I refuse to look. I am with MannMom3...really cool that you found a website that does that, but I will refrain from being the only person who gets 6 digits and a personal visit from Richard Simmons. I'm with the other ladies very afraid to look at the calories I consumed yesterday. Megan I am happy to find your blog today as I am visiting FQF blog hop. Your Christmas morning sounds interesting...and I liked how ya said you make a whole mess of breakfast for everyone! Sounds fun! Hop on by my blog if ya get a chance. People have been asking about those peppermint patties! Now that I have Nan's fridge in the basement I have plenty of room to make them again. However, I am desperately searching for some type of candy dipper so I don't have to use a toothpick to dip them in chocolate. It isn't very easy! Any my Christmas tradition generally includes the geriatric tour. I'm not going to lie, I despise Christmas. Mostly because it was not fun for me growing up. I think it's ridiculous to spend mass amounts of money on people for one day a year because it is somehow now a tradition. I like Thanksgiving so much better because you just get to hang out with family and eat. No pressure to buy the right gifts, no pressure to make sure everyone is treated fairly, no pressure to go broke. I'm not in the holiday mood this year.. probably since the house is under construction. In fact, I took down the stockings when we had to move for the construction happening this past August! I probably won't put them up this year.. probably won't even do gifts since slickdeals has been extremely disappointing this year so far. I'm going to be the Grinch this year I guess. Wonder how much of that is my birthday looming. Having some issues with how old I'm going to be!